After a cool, foggy summer, northern California seems to have decided to make up for all the lost heat in two days. Yesterday it was 106 degrees F (41.1 C) here in Santa Rosa. After lunch I dragged myself outside to water our lettuce and carrot seedlings and noticed a lot of wasp activity in and around the bird bath. After the sun had moved to the other side of our house, I spent some time (in the shade) spying on the wasps in my garden. Our front yard has plants that attract honey bees (Apis mellifera), California carpenter bees (Xylocopa sp.) 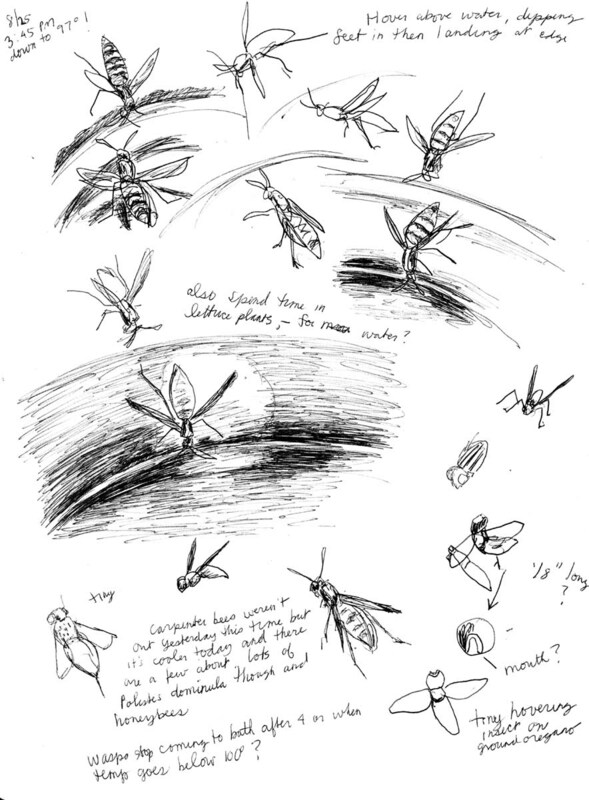 and the paper wasps (Polistes dominula). On sunny afternoons they all buzz harmoniously about some sages and oregano, drinking nectar. I've also noticed that the wasps spend a good deal of time visiting our lettuce patch, landing on the leaves and moving about for a minute or less then leaving. During our heat wave the wasps, and only the wasps, have been drinking and lounging in the water in our little bird baths. There seem to be three approaches: 1) fly by, dip toes in water, then land on edge of container and drink, 2) drop onto the water and float for a bit while sipping, 3) hover above the water, dipping frequently to sip. The wasps appeared to be utterly unconcerned by my presence. I sketched some more this afternoon, as the coastal influence began to reestablish itself (the fog's returning! ), and was interested to note that the wasps stopped drinking from the bath when the temperature dropped into the mid- or low 90s. These wasps are recent immigrants to our continent. Natives of Europe, they somehow found their way to Massachusetts in 1981 and then spread across the country with great haste. In some areas of the northeast they appear to be replacing native paper wasps. Their long hind legs and slender bodies make it easy to distinguish them from the similar looking yellow jacket (Vespula sp.). Oh, and as to why they hang out in our lettuce? We often water it at noon on warm days. I suspect that the wasps find the sheltered, shaded source of water appealing at that time of day. Over the years, the people who fish at Lake Ralphine have created several little clearings in the brush and grasses that grow along the edge of the water. I've discovered that many of them, especially at the gunky end of the lake, are great places to sit and wait for...whatever. Some days there's just not a lot happening. Other days, I can't draw all of the action that's going on and have to choose. This particular day there wasn't a whole lot to see, except for a few turtles poking their heads above the water and drifting, and a black phoebe (Sayornis nigricans) perched in small trees or shrubs on the other side of the lake, waiting for insects to fly by. One minute it was there and the next it wasn't. In northern California it's been gray and cold every morning, which is when I usually like to walk. I much prefer cooler weather to warmer weather, but find that after a summer of chilly mornings, even I yearn for sun and warmth. With that in mind, I delayed my walk on Monday and left at 9:30 a.m. instead of my usual 7:30 or 8:00 a.m. The sun was just coming out as I arrived at the park and I joyfully left my sweatshirt in the car as I began my walk. I was thrilled at the play of light and dark, even in the nearly noon sun, which is usually too glaring and harsh for my taste. The end of my walk was spent at Chloe's favorite spot, the picnic area by the edge of Lake Ralphine, the place where ground squirrels have little fear and a dog can drool and tremble as the youngest squirrels play double-dare with her. At the same time, several of the squirrels watched every human that entered the area, waiting for handouts. I captured a couple of them before their wishes were fulfilled by a young girl with a bag of chips. large party which Chloe and I crashed with great enthusiasm. 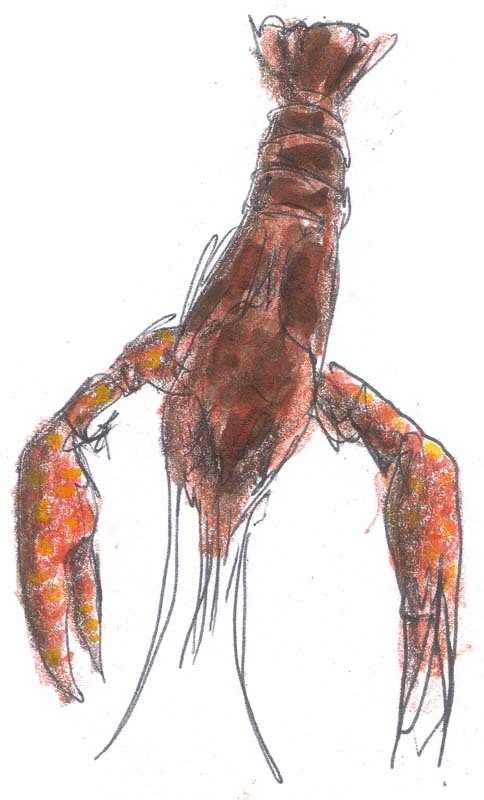 Most of the crayfish backed themselves into the lake, waving their claws menacingly, and disappeared under rocks. 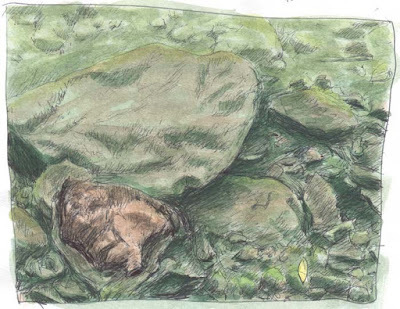 I sat down on one of the larger boulders, thinking I'd wait quietly and see if they'd come back out, and was surprised by a large crayfish hiding underneath my boulder and gesturing wildly at me to back off. I moved over to the next rock, out of the trapped crayfish's sight and waited. Those in the water slowly began to mill about and some even headed my way, but as soon as they saw me, did that strange backward crayfish shuffle and hid. In the meantime, the landlocked fellow edged his way back into the water and glared at me from behind a submerged rock. Hikers and fishermen began to appear and I decided to continue my walk and come back to what I now call Crayfish cove another day. The next morning I walked along the same trail, excited about what I might find in the cove. Sadly, there weren't any crayfish on land, but looking closely in the water revealed several of them partly hidden under rocks. 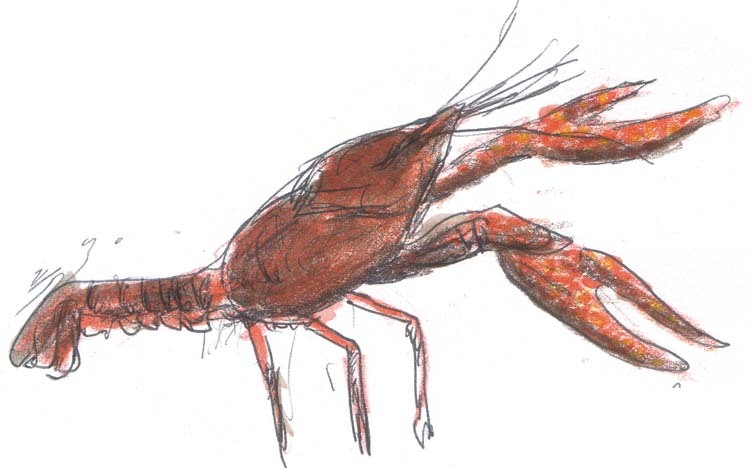 I began to sketch the underwater scene but the crayfish disapproved and all disappeared as I sketched. 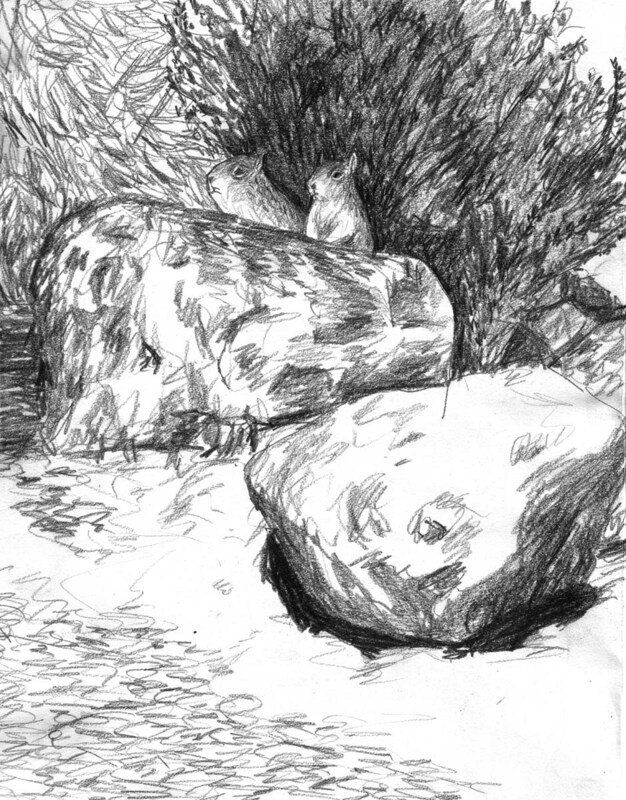 I was sorry to see them go but enjoyed sketching the submerged rocks anyway. A week later, I still hadn't found any crayfish roaming about but noticed that the water level was quite a bit higher, covering much of the beach with water. 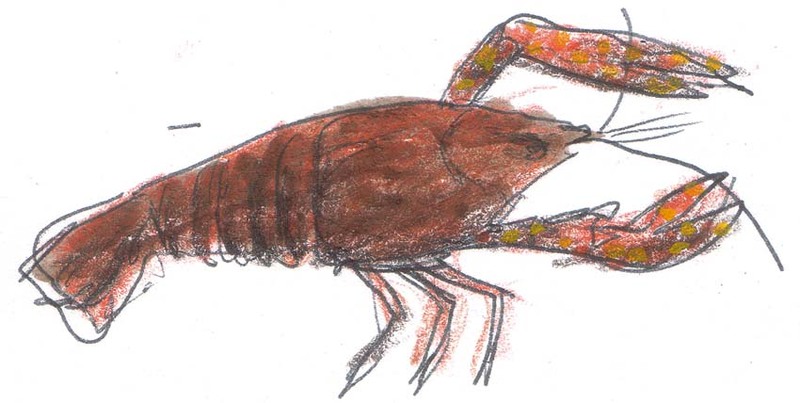 Perhaps, the crayfish had been disoriented by the lower water level. I still favor the notion that they were just having a really fine party that spilled over from night to day and I got there for the grand finale. There's a place in Howarth Park that Chloe and I both like to go and hang out. It's rocky and was partially quarried at some point in history and is easily reached from one trail. If you walk out across the rocks you can look far down on another trail. Or you can just sit in the middle and bask in the sun. If you stay a while you might see some deer toward the lower trail. If you stay quiet long enough lizards come out and bask, too, and birds fly about the blue oaks (Quercus douglasii) that grow in between the rocks. The sun was just beginning to warm things and Chloe and I were bouncing from rock to rock when I saw a flash of blue sticking out from under the rock I was about to leap onto. Chloe leapt onto the rock before I could stop her and the blue disappeared. I called her back and we sat down to wait out what I knew would be a Skilton's skink (Plestiodon skiltonianus). After a while a striped head poked out and then, with movement more like a snake than another lizard, the blue tailed skink traveled around the rock, clearly checking us out, it's shiny scales glistening as the sun finally broke free of the fog. I wondered, the first time I saw one of these beauties, why it would have a screaming blue tail. Although no one knows for sure, it's believed that the tail attracts a predator who grabs it and loses it's meal as the tail breaks free, letting the skink escape. A new tail will eventually grow back, and be just as detachable as the first one was. 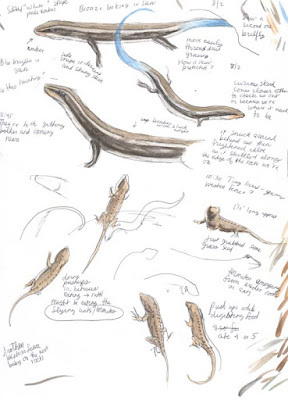 A skink with a bright tail is a young skink and, during breeding season in the spring, the head, chin and, sometimes, the sides, turn bright orange. After a while the skink wandered off to take care of more important things and I noticed a very young looking Western fence lizard (Sceloporus occidentalis) perched inconspicuously on another rock. At first it seemed to be dashing down the rock to eat grass seeds but that made no sense, since lizards are carnivorous, so I looked more closely and discovered that some ants or termites were flying out of the ground just below the rock. With what looked like very little effort that little lizard caught five insects in about two minutes! Looking around carefully with my binoculars, I spotted another young lizard blending beautifully into the rock it sat upon. Lake Ralphine was created in 1882 when a dam was built on a tributary of Santa Rosa Creek. The end near the dam is shallow and full of garbage, water weeds and logs. I guess it's warm, too, because I often see turtles floating near the surface when it's sunny. Last week I walked around the lake at the end of my morning walk, instead of at the beginning. I was hoping to see dragonflies and damselflies. 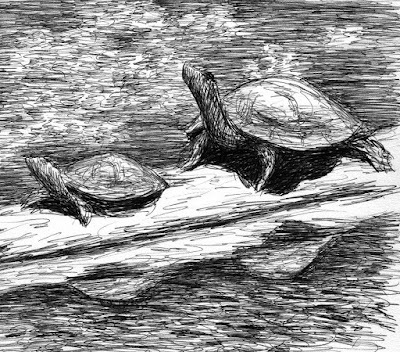 Instead, I saw turtles on logs, on rocks and, amazingly, one on the shore. Most of the time I can't tell, for sure, what kind of turtle I'm looking at. 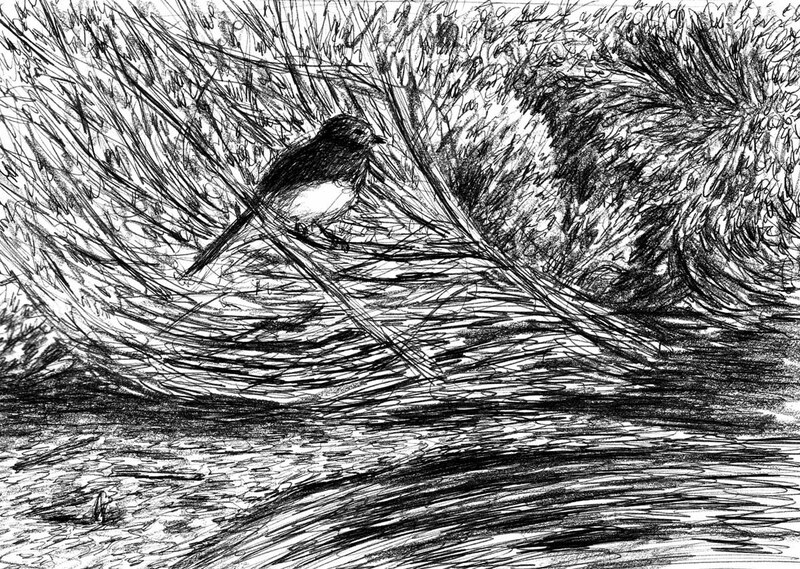 This one, though, was basking on the shore, just below the trail around the lake and continued to do so, while I sketched her. The red mark on her face easily identified her as a red-eared slider (Trachemys scripta elegans), not a native of our area. Although this species is native to the Mississippi valley in the United States, it has spread throughout the world as a pet that's often released in nearby ponds and lakes. I try to cram as many sketches on one page of my sketchbook as I can, which is why I've also included a sketch of a Lesser goldfinch (Spinus psaltria) singing it's heart out on a trail in the park. I wish I could draw it's gorgeous song. It's a complex, variable one that often fools me into thinking I'm hearing some other bird that I've never heard before. The sample at All About Birds gives you an idea, although it seems rather paltry compared to the song this bird was singing while I sketched him. 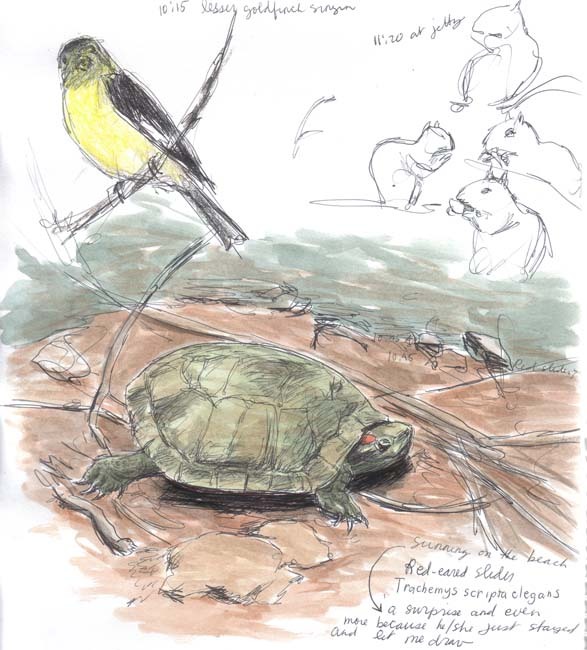 The little varmints in the right corner are Chloe's favorites, California ground squirrels (Spermophilus beecheyi). I'm quite fond of them, too and we watched them for a while at boat dock picnic area before leaving the park for the day.